Harplinge Windmill is one of the largest "Smock" mills left standing in Northern Europe. The windmill is an important landmark in the small village of Harplinge on the Swedish westcoast. Smock mills are unique in such way that the top floor can rotate 360 degrees, depending on where the wind is blowing from. This technique was introduced in the end of 19th century. Harplinge Windmill represents one of the latest generations of windmills and it's also one of the most technically advanced. Harplinge Windmill is the oldest and best preserved building in Harplinge and is of great importance as a symbol for the village and the surroundings. It was built in 1895 by Gustaf von Segebaden who decided to build the windmill close to the railway and near to the small hill Aggeredsberget that offered a good height. Until 1930 severals owners were in charge of the windmill. 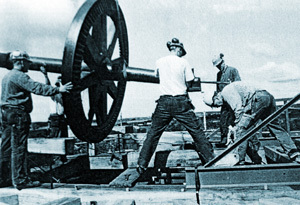 In 1932, Arnoff Persson becomes the new owner of the windmill and he makes several renovations. He modernized the machinery and the wind power was replaced with electricity. The great spur wheel and many other components was removed and close to the mill a cleanser for seeds was installed. 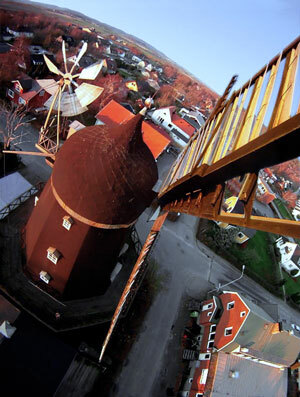 When Arnoff Persson died in 1954 the windmill was renovated and fully functional. In 1954, Bertil Svensson rented the windmill and he moved in. Four years later, in 1960, he bought the windmill and modernized the machinery once again, the council of Harplinge gave him a financial support to renovate the mill for cultural purposes. The renovation was made by Harry Johansson from Jonstorp. The balcony was totally rebuilt with pressure treated wood. The small bridge to the fantail was rebuilt with stronger materials, now using iron. The sails that suffered from rust where polished and repainted. 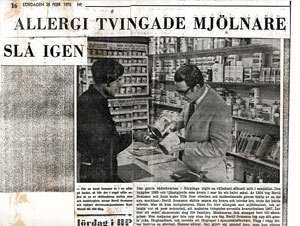 In 1967 the wife of Bertil Svensson, Ulla, had an flour allergy and therefore the production stopped and a big part of the machinery was sold. In the beginning of the 1990's the windmill suffered from very bad conditions and it was close to being demolished. 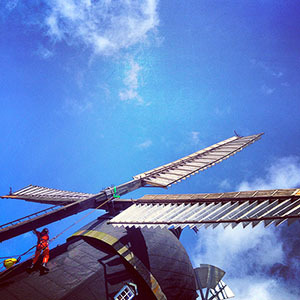 A renovation project started with the purpose of restoring the windmill to its original appearance and function. Traditional materials and methods where used. Several parts of the machinery where missing and new parts where made or bought. The sails with the iron construction where most probably installed in the 1930's, they where in bad conditions and new sails made of wood was installed. The purpose was not only to renovate the machinery and the function but also to renovate the exterior. The project called "Hallandsmodellen" was a regional cooperation between Länsarbetsnämnden, Länsstyrelsen and Hallands länsmuseer. 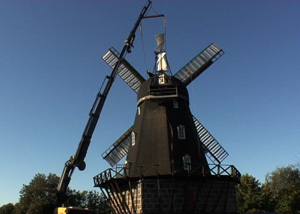 In january of 2010, the artists Mikael Ericsson and Julie Ericsson bought the windmill with the purpose of preserving the building and opening a laboratory for contemporary art. They made an inspection that showed that the windmill was in good condition but maintenance was need to not fall back to where it was in the 1990's. The first thing to be repaired was the 360 degrees rotating floor. When this part of the windmill is not working then the sails can't turn to the wind. The plans for an art laboratory came true when the pizzeria, that was renting a part of the windmill, moved out in april of 2011. The new owners had now the total control of the 800 square meters of area and a renovation started. The laboratory is developing and it's planned to be finished in 2015. In the summer of 2012 a renovation of the sails started, with the collaboration of Länsstyrelsen Halland and Kulturmiljö Halland. The renovation includes cleaning the sails from moss and fungus. The construction of the sails will also be supervised, nails, screws and other part will be replaced if necessary. The machinery of the windmill will be checked since it has not been used for many years. The goal of this renovation is to make it possible for the windmill to grind flour, therefore every single part of the machinery will be checked and replaced if it's not working. 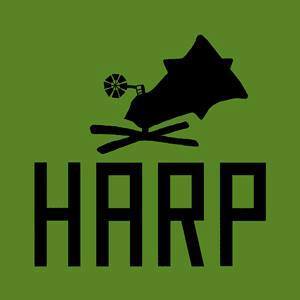 MILLOPHONIA is a site specific sound installation in Harp Art Lab, Harplinge windmill by Mikael Ericsson. The sails, of the windmill, are running two enormous bellows that are supplying a modified pipe organ with air. 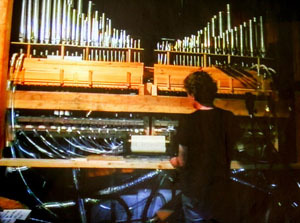 The sound is controlled by a pneumatic mechanism that operates the pipe organ action via piano-rolls that are preprogrammed by the artist. This procedure is 100% handmade by cutting, punching and stitching it all together to feed Millophonia with fresh sound art.